We have a cancellation policy of NO refund on the booking deposit (when paying in advance) for cancellation, no show or reduction in numbers. If your stay is longer than 2 nights, we will ask for a Security Deposit of 50% (no refundable). Please contact the Hostel to receive the required bank information. 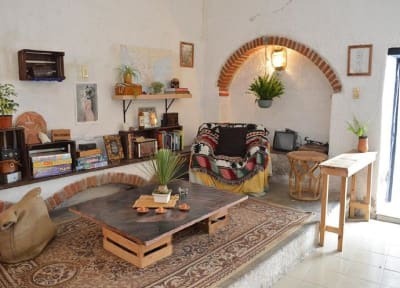 Corral d Comedias Hostel is located in the heart of the city, near to all the interesting spots of Guanajuato. Our hostel offers comfortable dorms with individual security lockers, hot showers, amazing common areas and equipped kitchen for our guests to enjoy. Wi-Fi services available, computer, books and board games are offered for free to our guests too. Our staff will be pleased to help anytime, always keeping a chilled, relaxed environment for you to feel at home. 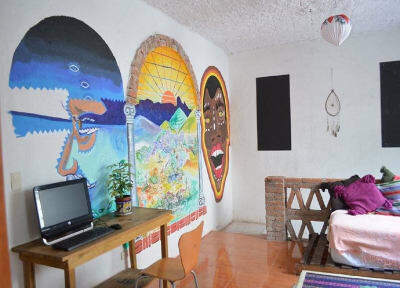 Corral d Comedias Hostel is located only 40 meters away from one of the main plazas in town: Plaza Baratillo, and only 5 min walking from the amazing Theatre Juarez, the main hot spot in town. Walking down the street, our guests can find a great variety of restaurants, museums, theatres, historical buildings, plazas and bars. Our dorms have comfortable bunk beds with security individual lockers underneath for our guests to keep their personal belongings. We also provide them with clean sheets, cosy pillows and warm blankets to guarantee a good night sleep. To the guests who stay longer than 1 night we offer Discounts in numerous restaurants, bars and activities in the area. No 24-hour reception. Opening time: from 8 am to 12 am. Very nice hostel! I enjoyed my stay there a lot, the staff is super friendly and it’s very social, in the evenings friends of the staff come by and there is a super nice atmosphere to get to know people. The breakfast is different every day and super delicious! And vegetarian! Bed was good, bathrooms clean and the kitchen was nicely equipped. I would definitely stay there again. Great space to relax and meet other travellers. A very homey hostel, with beautiful art, comphy couches and very clean! Great spot and would 100% stay again. Thou I only stayed here one night it was my best night in Guanajuato! The staff was incredibly friendly and really welcoming, the hostel vibe there was just real great, some travelers were booked for weeks and I can see why, it was really relaxing. The lounge area was big and the kitchen was clean with lots of pans and plates to use, the bathrooms were clean with plenty of hot water. I really like the beds they are comfy and the clean, I want to comeback just to stay in this hostel! Estuve solo una noche y me pareció muy inseguro y no tan limpio. Location is great! No lockers, bathrooms were not clean, building very cold during night and in general also, no formal reception counter very casual checkin - may be way too casual. People were good though. Breakfast was good too. Private room had a lock on the door but no key, had to keep everything unlocked while out for the day. Our mattress was extremely stained and dirty and sheets were thin and did not appear clean, we slept on the towels we brought. We were the only guests there and the second night staff decided to hang out with other staff and friends in the common area playing music, talking and laughing loudly until 3am when quiet hours were marked for 9pm. Asked them twice to quiet down with no response. The common area felt like the staff's personal living room. They were watching movies in the common area with high volume from the time we arrived till late. The beds were super squeaky, made noise even if you moved a finger. They put 5 people in one dorm and the other dorm had only 1 person. Very loud church bells that shake you out of sleep from 5am. Breakfast supposed to be from 9am, but a volunteer was sleeping in the common area with a dog till 9:10am, no coffee and no signs of breakfast.